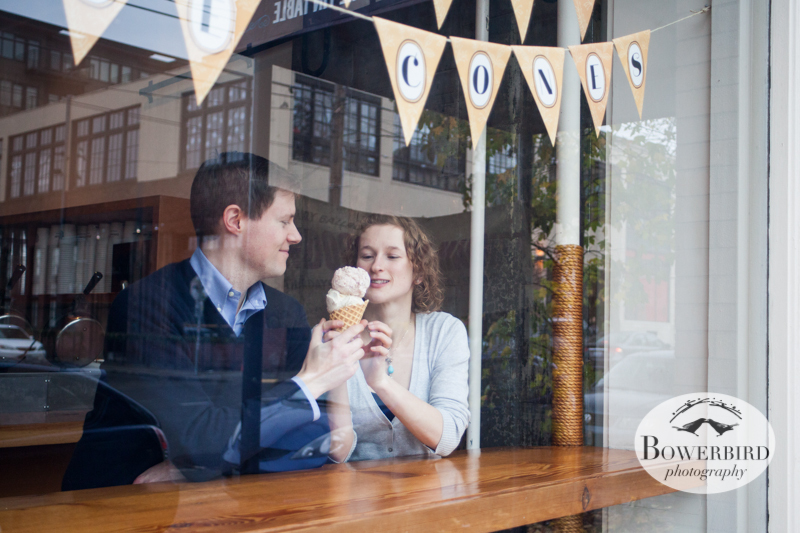 © Bowerbird Photography 2012; Couple's Photography in Seattle. Four and half years ago, Mel and Gus embarked on a spectacular love voyage, witnessed in this photo taken on their wedding day. Gus mans the oars, maneuvering through the lily pads, as Mel looks back and waves. It's a photo that tells a hundred beautiful stories. Everyone who sees the photograph wants to learn more, and invariably asks, "Where are they going?" That is a very good question. For these inquisitive fans, we are pleased to give a news update! After spending a day taking photos with them last Sunday in Seattle, we are happy to announce that, among other accomplishments, they have, in our opinion, mastered the Art of the Perfect Date. They packed so much fun and romance in our hop-around-town photo session that we just have to share some sneak peek images from the lovely outing. First, the day started at their favorite weekend breakfast spot, the Volunteer Park Cafe, which was festively festooned with boughs of fir for the holiday. It seems that every Seattleite either took their turn as a barista in their youth, skipped that step and bought an espresso machine for their home kitchen, or both. This hometown couple also knows a well-roasted bean like a bee knows its blossoms. They are more than mere connoisseurs; they understand the romantic alchemy contained in the Northwest's antidote for rainy days. The beverage bends time itself. Hours are not counted in minutes, but are slowly decanted with periodic sips from steaming cups of hot brew. Shared moments last twice as long. After whiling away the time with warm mug in hand, their paws are perfectly primed for a long period of romantic hand-holding. And so, we follow these java-fueled lovers onto the next stage of their date. Okay, it's about that time. Cue the romantic movie montage! #1 - The Cute-Walk: Mel + Gus take a lover's stroll along the water's edge at Lake Washington. #2 - Shared Interests: they read travel books together to remember their romantic trip to Italy at the legendary Elliott Bay Bookstore. #3 - The Soundtrack: they browse through some LPs and joke about album covers as the music soars. #4 - The Ice Cream Parlor: the couple shares two scoops on a waffle cone at Mollie Moon's, and Gus manages to get a little on his nose. Ice cream dates are the cutest! Sunday morning coffee at the Volunteer Park Cafe. © Bowerbird Photography 2012; Couple's Photography in Seattle. Love over coffee and tea. © Bowerbird Photography 2012; Couple's Photography in Seattle. 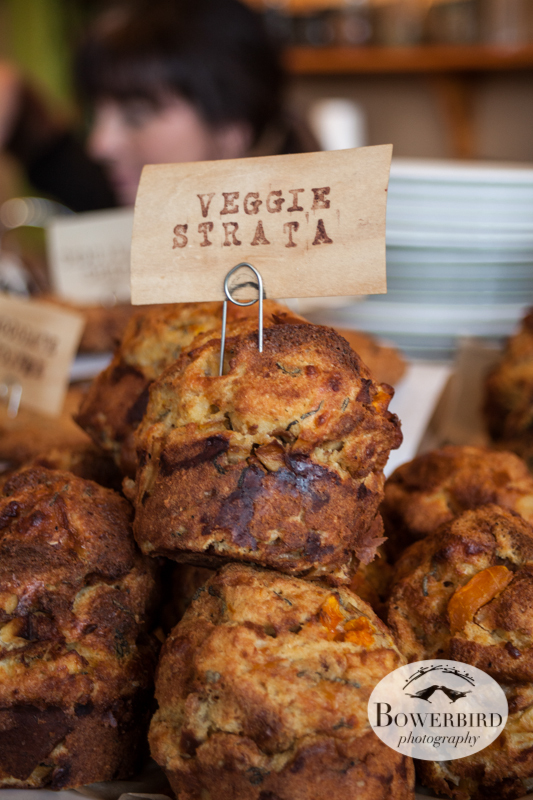 Edible delights at the cafe.© Bowerbird Photography 2012; Couple's Photography in Seattle. Peeking in the window of their new beautiful home! © Bowerbird Photography 2012; Couple's Photography in Seattle. A tender moment by Lake Washington. © Bowerbird Photography 2012; Couple's Photography in Seattle. Love birds! 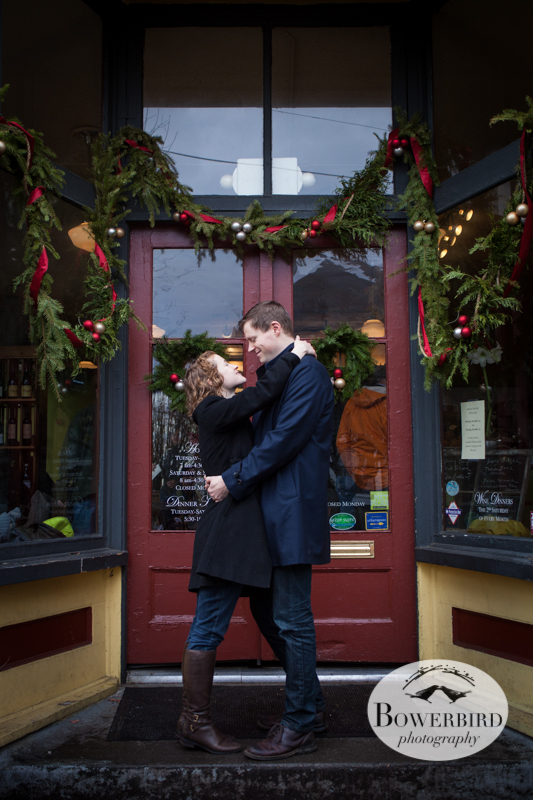 © Bowerbird Photography 2012; Couple's Photography in Seattle. It's getting steamy in the stacks! © Bowerbird Photography 2012; Couple's Photography in Seattle. A stop at the Elliot Bay Books. © Bowerbird Photography 2012; Couple's Photography in Seattle. Music shop fun. © Bowerbird Photography 2012; Couple's Photography in Seattle. It's never too cold out for ice cream! © Bowerbird Photography 2012; Couple's Photography in Seattle. Oh, and you might ask, "where is this wonderful couple off to now?" One perfect date after another. Best wishes to Mel and Gus on their new home, and to many more wonderful adventures together!